Why USA love and hate Nordic Model? The Nordic countries combined are home to a geographic territory encompassing roughly the population of Texas. But, Nordic nations top recent worldwide rankings as the best places on earth to be a woman (Iceland), get educated (Finland), be prosperous (Norway), save the environment (Sweden), and just be happy (Denmark). In fact, Nordic nations can teach USA about childcare (Sweden), education (Finland), worker retraining (Denmark) and taxing and regulating the wealth of natural resources (as done in Norway). These strong, egalitarian Nordic states might be the product of their particular histories, cultures or relatively homogeneous populations and therefore that their way might not be so readily applied to USA. In comparison to USA, self-expression (rather than survival) values and secular-rational (rather than traditional or religious) values happens to be highest in the Nordic nations. There’s a significant portion of the Americans left who would like to turn the United States into something like Nordic region. A socially democratic state, with free education, free childcare, free health care and so on. However, Nordic brand happens to be more than that. Mainly, it conveys Trust, new way of thinking, sustainable development, compassion and openness. Due to current President’s inclination, the United States is in the midst of an episode of chronic ‘Nordicmania’ , brought on in part by the habitually high placing of Sweden and its similarly prosperous, egalitarian, collectivist neighbors — Denmark, Norway, Iceland and Finland — in global rankings of everything from happiness to lack of corruption, gender equality and consumption of organic root vegetables. When compared to American ‘individualism’, there is another dimension that fosters risk-taking on a society-wide basis, which the Swedish historian Lars Tragardh calls “Nordic statist individualism.” The basic idea is that individuals who are free and secure are also more likely to innovate, experiment and take risks. In contrast to the American model, which also emphasizes individualism, in Nordic model every person has a positive (and positively acknowledged) individual relationship with the state. Accordingly, the Nordic people view the role of the state and government not as an intrusion into individual freedom, but actually as an enhancement. It strengthens their individual development. In summary, Finland has the western world’s finest education system, according to the Organization for Economic Cooperation and Development. Similarly, Sweden has taken in more refugees, proportionally, than any European country. Icelanders too - spawn of a Nordic settler colony - buy more books than anyone and draw most of their energy from geothermal power. No doubt, in 2012, Denmark took first place in the United Nations’ inaugural World Happiness Report, having topped similar surveys for decades. 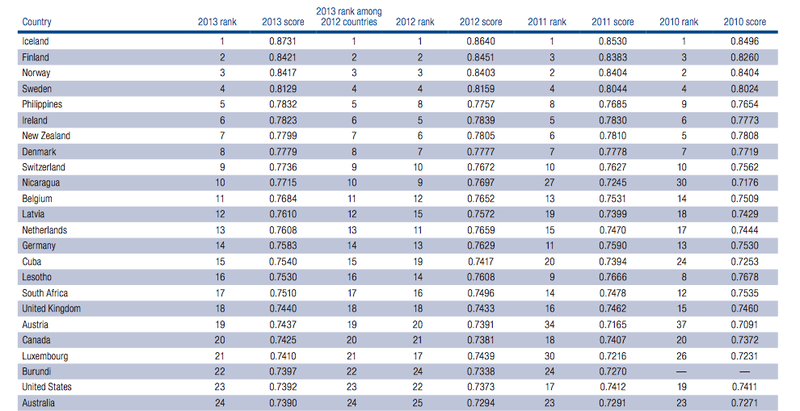 See Figure 1 for index rankings for best countries 2012. Historically, the Nordic region’s political economy had developed along somewhat different lines than America’s. Sweden and Norway had some big imperialist adventures, but this behavior declined following the Napoleonic Wars. After that, they invested in the military to ward off invaders, but they were less interested in building it up to deal with bloated colonial structures and foreign adventures. Overall Nordic countries devoted fewer resources to the military — the arena where patriarchal values tend to get emphasized and entrenched. Iceland, for example, spends the world’s lowest percentage of GDP on its military. Subsequently, industrialization has a part of the story, too: it hit the Nordic countries late. In the 19th century, Scandinavia did have a rich and powerful merchant class, but the region never produced ‘the Gilded Age’ industrial titans and extreme concentration of wealth that happened in America back then, and has returned today(Income inequality and discrimination of all kinds seem to go hand-in-hand). Over time, Nordic countries became modern social democratic states where wealth is more evenly distributed, education is typically free up through university, and the social safety net allows women to work comfortably and raise a family. Nordic moms aren’t agonized over work-family balance. Parents can take a year or more of paid parental leave. Dads are expected to be equal partners in child rearing, and they seem to like it. Islands and Aland) would retain individual legislatures for local matters. But economic and labor-market policy would be coordinated, and foreign and defence policy would be ceded to the federation. How this would chime with the European Union is not clear: three of the countries are in EU, Norway is out and Iceland has renounced membership attempts ; only Finland is in the euro. Historically, Nordic countries, Germany, Baltic countries and Poland as a group had formed a separate, viable economic alliance ; a modern version of the Hanseatic League of merchant guilds and cities that dominated the region during the 13th to 17th centuries. Gunnar Myrdal, the Swedish Nobel laureate, was an influential theorist of the Nordic approach. As a young economist, he had championed some demand-side policies. In his 1957 study “Economic Theory and Underdeveloped Regions” and elsewhere, he suggested that a Nordic-style model was not only good social policy but smart economics. Contrary to the classical theory, Myrdal argued, deregulated markets don’t reach to equilibrium. Myrdal’s thinking was shaped by years he spent studying the plight of black people in the United States. His best-known work, “An American Dilemma” (1944), explored a disconnect : Why was one group persistently at the bottom of the socioeconomic spectrum in a country that purported to give everybody an equal chance? It is not the first time, the Nordic countries have come in the international limelight. In the 1950s and 1960s, Nordic region was famous for ability to combine a great improvement in living standards with the development of a universal welfare model characterized by generous public services and higher taxes. Enthusiasm for the model was dampened over the next few decades, with countries in turn were hit by banking and housing crises, declining international competitiveness and low growth. Under the attack was the typical understanding of the Nordic model as a welfare state with a relatively even distribution of income generated from a large public sector, a high tax burden offering a finely meshed social safety net for citizens and a wide supply of public services 'from cradle to grave'. In such period, recovery was assisted by the public sector playing a major role and it was equally significant that the private sector became market-oriented, with relatively flexible product and supportive labor market. USA can have such welfare state (like Nordic) and equity just by taxing the snot out of everyone which in turn impact the growth. So, the solution is to have as classically liberal an economy as one can, with the least regulation of who does what and how, then tax the snot out of it to pay for that welfare state. In comparison, Nordic welfare states are very local. The national income tax rate in Denmark starts out at 3.76% and peaks at 15%. There’s also very stiff, 25-30% of income, taxes at the commune level. A commune being possibly as small as a township (10,000 people) in the USA . The point being that this welfare state is paid for out of taxes raised locally and spent locally. In contrast, the American left tells us that the USA should work differently - all taxed money goes to Washington and then the bright technocrats disburse it. In the end, USA left have to modify its model to suit the local-level. - collection and spending of taxes locally would lead to people willing to pay higher taxes. In the United States, freedom is conceived differently. It distinguishes between the “freedom to be” (Nordic) and the “freedom to do” (quintessentially American). But a more basic distinction rests with the locus of control. Denmark continues to distinguish itself through the benefits of its flexicurity system, as it has one of the most efficient labour markets (1st in EU), combined with a strong social safety net. Nordic consensus can perhaps be best exemplified by the role of unions in the region, which are often on the side of employers as they seek workable solutions. Hence, union representatives sit on the boards of big companies. American-style political gridlock would be inconceivable in the Nordic region. It is hard time explaining to outsiders that union stands for innovation, globalization, even “robots,” because labour knows the Nordic region can’t compete with cheap labor in China or India. It is new technology and a highly educated workforce that makes it competitive. Denmark began offering a state benefits program to older people only in 1891. The modern Nordic welfare state had its distinctive form. The model, crucially, interprets “welfare” to mean not just financial capacity but well-being. It might take into account that a woman forced to defer dreams of motherhood because of work, or vice versa, can be a hostage to her circumstances even if she would be able to pay her bills. In comparison to other countries, parents in Sweden and the other main Nordic countries have worked weeks relatively shorter than the OECD average. This is in addition to their substantial paid parental leave and publicly provided child care. The lowest wage levels (Lowest wage as a percentage of the average wage) are considerably higher (Nordic 0.51-0.64) than in countries with liberal labour market systems, such as the United Kingdom and the United States, where the minimum wage is, respectively, 0.42 and 0.36 of the average wage. In the Nordic region important parts of the wage formation have been taking place on a nationally coordinated level with strong social partners. It is necessary to have strong parties representing both employees and employers to achieve a nationally coordinated wage formation, because this allows you to take into account both real wage growth and employment levels. Denmark, like Sweden, invests in comprehensive skills training as part of providing security and flexibility in employment. This includes quality skills retraining programs of the kind which industry workers will need. The level of unionization is high in the Nordic countries. An exception is Norway, where just over 50 per cent are unionized. One reason for the relatively low level of unionization in Norway is that unemployment insurance has been compulsory in Norway since the 1930s, while it is linked to the trade unions in Denmark, Finland and Sweden (the so-called Ghent model). In Sweden, the level of unionization has declined from about 90 percent of wage-earners to 70 percent in recent years. Many left-liberals have a real idea about successful working of the social democracies of Nordic. As the University of Arizona sociologist Lane Kenworthy has put it, “Over the course of the next half century, the array of social programs offered by the federal government of the United States will increasingly come to resemble the ones offered by [the Nordic welfare states].” The protection of the workers' employment relationship is relatively weak (in USA), which in combination with the rules for unemployment benefits and least active labor market policies (frequent contact meetings between the unemployed and job centers and employment program for the unemployed who have difficulty finding a job) makes it relatively easy both to fire and hire people. The Nordic tenets champions propagate the provision of universal welfare, full employment and equality. Another common feature of the Nordic countries relates to public finances, which is remarkably stronger than in most other OECD countries. Citizens here don’t need to save for medical emergencies, unexpected unemployment, pre-school, or college education. Nordic countries have one of the world’s largest pension funds and bonds market. Nordic pension funds are arguably harbouring more expertise than their European counterparts in coping with complex investment instruments, such as derivatives and private equity. Socially responsible investment is another theme that is being more widely adopted by Nordic pension funds than other European schemes. The Nordic region has long been a champion of SRI and many pre and post-trade related services have been developed for this region. If the Democrats of USA have their way than after introducing universal health-care (Obamacare), they would move into their next project - universal preschool education (as in Nordic model). In many countries (such as Nordic countries), health spending is largely financed out of taxes or social security contributions, with private insurance or ‘out-of-pocket’ payments playing a significant but secondary role. This is not the case in the United States, where the government plays the smallest role in financing health spending. Public expenditure in the United States, the government provides insurance coverage only for elderly and disabled people (through Medicare) and some of the poor (through Medicaid and the State Children’s Health Insurance Program, SCHIP), whereas in most other OECD countries this is enough for the government to provide universal primary health insurance. Many women participating in the labour market have become an important part of the Nordic welfare model. This has lead to have enough nurseries and sufficient childcare. The Nordic countries have seen cutting edge models in the areas of family policy and child care. However, there cannot be one Nordic child care model. Sweden in particular differs from the rest in its strong ideological advocacy of daycare from age one and its prohibition of home education. If there is to be an ideal childcare model, the Finnish model seems to qualify a lot better than the Swedish model. Finland has a universal home care allowance of about 300 euros per month introduced in 1985, which any parent can use until the child's third birthday if their child is not in daycare. Thus, nearly two-thirds of all Finnish children under three are at home, and less than half go to daycare during the entire pre-school period. Furthermore, before- and after school care is much less used in Finland than in Sweden. Also Norway has a form of home care allowance introduced by a Conservative government in 1998. Later Social Democratic government wanted to abolish the allowance for ideological reasons, but realised it could not afford to do so as there simply weren't enough daycare institutions available. However, they have lowered the amount paid to home care parents. Leaving the labour market and becoming a pensioner means making many re-adjustments, particularly from the financial point of view. The old-age pension will, on average, be the principal means of support for the individual for up to 20 years. The statutory pension systems in the Nordic countries all include basic security. This basic security entails a right to a certain pension which is payable regardless of previous earnings or contributions that have been paid in. It guarantees all pensioners a minimum standard of living. A retirement age is defined somewhere in the rules governing the national old-age pension systems in all the Nordic countries – at present it is 65 in Denmark, Finland and Sweden and 67 in Norway, the Faeroe Islands and Iceland. Generally, public assistance for senior citizens has been provided mainly by the national government and the local municipalities. The municipalities set up and run different councils intended to promote user influence and senior citizen councils. Senior citizens can avail of a wide range of services. Apart from managed institutions, home care services do have the most common services. Home care services have been targeted at seniors who live at home but who cannot manage everyday life without help. Citizens use both entitled practical assistance (e.g. cleaning and laundering) and personal assistance (e.g. bathing or shaving). Both types of assistance comes free of charge and are made available 24 hours a day. Municipalities pay an activity based contribution for the treatment of local citizens in the hospital sector and the primary health care service. Local co-financing amounts to approximately 18 % of the funding in 2014. Also for elderly, some 100,000 women have to cut their working hours because they say they need to look after older relatives. Norway happens to be the happiest place to age, followed by Sweden, Switzerland, and Canada. Nordic countries have well-developed organizations for the elderly, a long history of state welfare and strong social media campaigns that create public awareness of age-related issues. Finnish schools (the best in the world, says Smithsonian Magazine) dominated the top spot in education for half a decade for many years. Nordic states also turned to literacy as a stabilizing force in the late 18th century. By 1842, Sweden had made education compulsory for both boys and girls. Researchers have found that the more literate the society in general, the more egalitarian it is likely to be, and vice verse. But the literacy rate in the USA too remains very high. Basically, no tuition fees remain applicable at the compulsory school level in any Nordic country. The Nordic countries characterize high educational participation. International statistics show that the expected period in education for children at seven years of age remains among the highest in the world. The proportion of students that embarks on upper secondary school studies after compulsory school exceeds 90 per cent in all Nordic countries. Also, Young people in Denmark and Norway have enjoyed a markedly higher employment level than those in Finland and Sweden, where levels remains close to the EU15 average. In Denmark and Norway, where large cohorts of young people undergo apprenticeship training, the employment rate becomes higher because apprentices gets registered as employees, while students in school-based vocational training programmes which dominate in Sweden and Finland (countries without extensive apprenticeship training) do not reflect as a part of the workforce. As prevailing in the USA, the Washington Post cannot remain immune to Nordic’s charms, recently marveling at how Danish branches of McDonald’s manage to pay their employees 2.5 times U.S. McDonald’s workers’ wages (however, about 75 percent of earnings may disappear as taxes). The earned income tax burden for a family of four with a single wage earner in Sweden is close to 38 percent, according to the Organization for Economic Cooperation and Development (OECD), compared with the United States at 20.3 percent (and 38 percent in Finland, 31 percent in Norway, and 28 percent in Denmark). According to Newsweek, Iceland happens to be the best place in the world to be a female, and gender equality in Denmark remains so deeply rooted that it startles even some enlightened American women - checks on a first date are split, and door-holding - considered rude. In terms of income distribution, the Nordic countries have much more equality than Australia, Britain, New Zealand and Canada – and nearly twice as much as the United States. Nordic people happen to be among the happiest and healthiest people on Earth. Iceland, Denmark, Norway, Sweden and Finland all were placed among the world’s ten happiest countries. 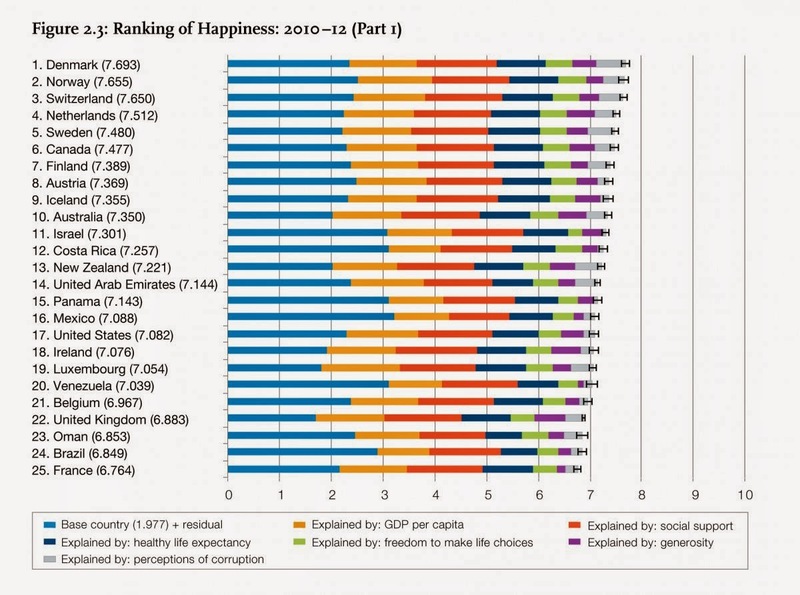 The second World Happiness Report utilized factors such as GDP, life expectancy, social support, “perceptions of corruption”, and “freedom to make life choices”, to assign each country a total score. The report was based on statistics compiled between 2010 and 2012 by the United Nations Sustainable Development Solutions Network. 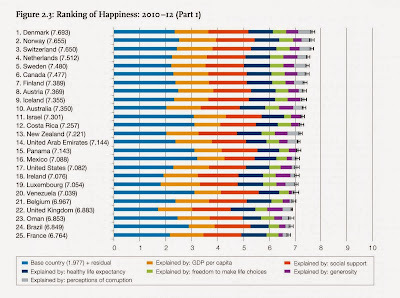 See Figure 2 for the Happiness Report. With university systems over a century ago, Denmark and Sweden, have developed innovation policies in which universities play a very central role. In contrast, Finland and Norway - relatively younger nation states with less - well developed university systems a century ago – developed systems in which public research organizations outside universities – the “institutes”- became large and powerful actors in the innovation system. Nordic countries have created new organizations within the public sector devoted to supporting innovation, such as TEKES in Finland (1983), VINNOVA in Sweden (2001), The Norwegian Research Council’s Innovation Division (2002) and Innovation Norway (2004) in Norway, and The Council for Technology and Innovation (2002-3) and the new Innovation Foundation to be set up in 2014 in Denmark. Accordingly, Nordic countries have an international orientation in the form of large trade and integrated financial markets with the rest of the world. Also a positive attitude to the introduction of new technology has long been a central part of the Nordic model. Finland remains one of the innovation powerhouses in Europe, ranking 1st. Sweden’s number two ranking in the innovative Europe pillar. Thirty years of environmental awareness in the Nordic countries, mixed with continuing rising oil prices and a global economic crisis, have led to more investment in the Nordic capitals towards sustainable practices across sectors. Previously, green efforts were mostly taken as private initiatives with households recycling waste and buying more environmentally friendly products. Today, green initiatives have taken place at national and global levels – and most importantly – they have been linked to the economy giving the green issue a whole new powerful force. Nordic nations continue to provide living proof that economic prosperity can be combined with social equality and environmental responsibility. Sweden is also ranked 1st in the environmental sustainability pillar. Torvalds going on to develop Git. Nokia was at the forefront of technological innovation in the nineties, and they are also home to Rovio, the team behind Angry Birds, the best selling paid app of all time. Birthplace of iZettle, and Spotify, Sweden is also widely regarded as the number one game producers in the world, including Mojang, makers of Minecraft, and King.com the leaders in the social gaming space, and producers of Candy Crush. Norway also gave birth to Siri, the personal assistant software developed by Dag Kittlaus, and subsequently sold to Apple in 2010 for a rumoured $200 million. The Norwegian software company Opera produces the worlds most popular cloud-assisted mobile web browser. Finland has become a global leader in a digital economy space (1st rank). Sweden also has made great strides in encouraging the uptake of latest digital technologies to enhance productivity and innovation (2nd in the digital agenda pillar). Compared to other European nations, the income spread in the Nordic countries has been relatively small measured by the Gini coefficient and the 80/20 quotient and that the poverty rate remains low. The Gini coefficient has been known to be a measure of how a society’s total income is distributed among individuals (or households) and assumes a value between 0 and 1. Relative to EU15 nations, income differences gets even greater in America - USA has a Gini coefficient of 0.38 and a poverty rate of about 17 per cent (OECD 2011a and 2011b). In contrast, for Nordic region value varies from 0.24 to 0.27 (EU 0.31). 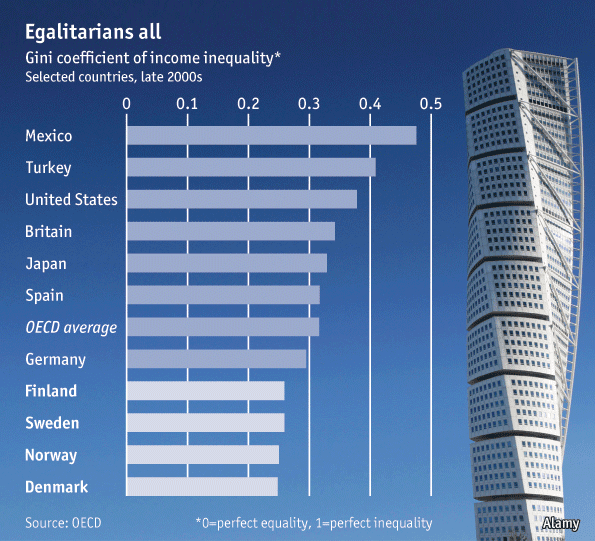 See Figure 3 for gini coefficient distribution across countries. embracing system thrives. Nordic voters have never rejected the fundamentals of a welfare state. Nor did the Swedish people recently vote in favor of more economic inequality on the scale which exists in the English-speaking world. Neighbourly, Denmark too remains a more homogenous society. Union (EU) average of no growth. As Europe's biggest oil exporter, falling oil prices are weighing on Norway, although its reserves remain bolstered by a sizable sovereign wealth fund. The Norwegian krone, whose performance get strongly tied to oil prices, has steadily weakened against the U.S. dollar since mid-August last year. Krone had fallen down around 2.5 percent since the start of 2015 - providing a possible spur to exports. To reduce the risks linked to the increasing household debt, Sweden was forced to introduce stricter rules for amortization, which would increase savings and thereby reduce the strength of domestic demand – the main engine in the Swedish economy in recent years. As Russia being Finland's largest trading partner, with major exports such as machinery, forest and chemical products and dairy foodstuffs. Nordic country continues to face trade embargo imposed by EU on Russia. Still, foreign buyers get attracted to the region’s many export-driven companies, whose revenue is less dependent on any one country. Many Nordic-headquartered businesses have specific technologies and products with global reach. The U.S. remains the world’s undisputed economic superpower with a GDP of $16.7 trillion last year, nearly a quarter of the global total. Relatively, the Nordic region’s total GDP has reached the world's 11th largest spot. While Southern Europe struggles to bring in foreign money for mergers and acquisitions, the Nordic region has been on fire. Sweden, Norway, Denmark, Finland, and Iceland have seen about $288 billion in deals since the financial meltdown began in 2007, according to data compiled by Bloomberg. Recently, Forbes magazine has put together their annual list of best countries for business and Denmark tops that list. In contrast to USA, Denmark has been a rather large welfare state built upon a classically liberal economy. In the same survey, USA ranks 18th down four spots from last year. It marks the fifth straight year of declines since 2009, when USA ranked second. Denmark continued its reign three straight years between 2008 and 2010. One of the keys to Denmark’s pro-business climate have been its flexible labor market known as “Flexisecurity,”where companies can easily hire and fire workers with out-of-work adults eligible for significant unemployment benefits. Unemployed workers become eligible for training programs. It creates one of the most productive workforces in Europe. 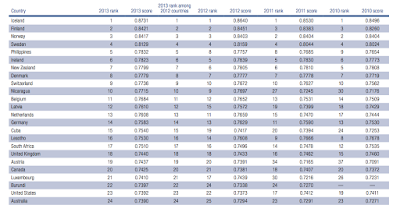 Again, Finland ranks 1st in the latest edition of the Europe 2020 Competitiveness Index. Finnish have a creative capacity that transcends language and cultural barriers to fascinate, humor, and entertain global markets. They create the games and toys that mesmerize mobile users worldwide, such as the Swedish Candy Crush Saga or the Finnish Angry Birds, and the Danish LEGO bricks that litter modern childhood. Skype – a company founded by a Swede and a Dane, along with some Estonian developers – revolutionized telecommunications, too. The Nordic countries simply work well, sustaining the security of a welfare state while being unabashed capitalists and innovators, adapting to change, and doing so with a long tradition of pragmatic consensus. No doubt, Nordics always argue that it is their social security net that fosters innovation by allowing entrepreneurs to try, err, and still survive. For assistance, the Nordic Web exists which is a digital publication taking an in-depth look at the Nordic technology scene, with features and analysis on ideas, innovation, design and startups originating from the region. Similarly, Denmark too happens to be one of the most entrepreneurial countries in the world. The government streamlines the startup process with only four procedures needed to start a new business and at minimal costs. The regulatory climate is also one of the most efficient. Nordic cooperative sector played an important role in the society. For example, in consumer sector or in agricultural products or in elderly care or in pension funds or in animal husbandry, cooperative sector has shown excellence politically and economically. To quote a few, Arla Foods has been a Swedish-Danish cooperative based in Aarhus, Denmark, and the largest producer of dairy products in Nordic. Danish Crown AmbA too happens to be Denmark's largest meatpacker cooperative based in Aarhus, Denmark. It processes meat from pigs and cattle, but not from chicken and other poultry. It is the world's largest exporter of pig meat products with subsidiaries in other countries. FDB (Danish: Fællesforeningen for Danmarks Brugsforeninger), or The Danish Consumers Co-operative Society exists as a consumer co-operative based in Denmark. teams. The Nordic countries have been very good at adapting if they do something wrong. So you would be able to say, hey, we have made a mistake, we need to change this. The Nordic countries have the world's top four judicial systems according to the World Justice Project's Rule of Law Index 2014. The ranking, compiled by accountancy firm PwC, was based on a twenty different factors including technology, regulatory framework, sustainability, and other economic indicators to give a "holistic measure of a country's performance and progress over time". Sweden tops the list, which achieved an overall score of 70.5 on PwC's Escape (Economic, Social, Communication, Political and Environmental) index, Nordic neighbour Finland landed in fifth place, followed by Denmark. Once the darling of progressives, Sweden has now become a model for free-market-leaning thinkers. If Sweden is the Nordic country to have gone the furthest in shrinking its welfare state, Denmark too has moved the farthest. Only Norway looks unlikely to reform entitlements anytime soon, bolstered by its oil wealth. The country houses the world's largest sovereign wealth fund. Worth 5,116 billion kroner, each of Norway's 5,096,000 inhabitants remains, at least on paper, a millionaire. other developed nations - particularly characteristic of the Region - trust. In the Nordic countries, trust has been generated by delivering relative economic equality and maintaining low levels of corruption. The degree of trust in the governance structures, and especially in the legal system, also influences mutual trust between people. In the Nordic countries, the level of trust in other people was 6.6 (on a 0-10 scale); in politicians 4.8; and in the legal system 6.9. In continental Europe, the comparative figures were 5.0, 3.9 and 5.3, respectively. 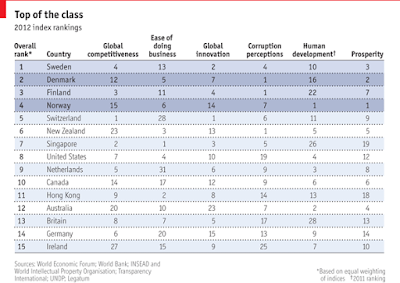 Nordics are one of the world's least corrupt states at number ones in the world. Accordingly, as per the Transparency International, Nordic remains among the best countries. the fifth year in a row), followed by Finland, Norway, and Sweden. (Denmark came in eighth). See Figure 4 for the Global Gender Gap Report ranks countries based on where women have the most equal access to education and healthcare, and where they can participate most fully in the country’s political and economic life. According to the 2013 report, Icelandic women pretty much have it all. Their sisters in Finland, Norway, and Sweden have it pretty good, too: those countries came in second, third and fourth, respectively. Denmark continues not far behind at number seven. The U.S. comes in at a dismal 23rd. Lutheran state churches in Denmark, Sweden, Finland, Norway and Iceland have had female priests since the middle of the 20th century, and today, the Swedish Lutheran Church even has a female archbishop. The Nordic foreign ministers collaborate on joint missions abroad and development projects in the Third World, defense ministers collaborate on joint procurement and emergency services. Except for Norway and Iceland, Nordic countries have joined EU. But, in case of EURO zone, only Finland agreed to participate. Coordination Committee consists of flag-officers, representing the nations´ chiefs of defence. However, The NORDEFCO structure remains to be a cooperation structure, not a command structure. Cooperation activities get initiated from top or bottom have to be facilitated and agreed within the structure, but the actual realization and participation in activities remain national decisions. Norway, Iceland and Denmark are part of NATO. While Sweden and Finland have resisted joining USA in security matters. been challenged” Nordic social reformers – as early as the 1930s – were genuine in their ambition to marry government stimuli and social solidarity on the one hand with open trade and private entrepreneurship on the other. It was the only way to grow their economies and continue paying for their welfare states. Finally, after evaluating the pros and cons of 'Nordic Model' and 'American Capitalist (filtering down from rich to poor)', it was found that Nordic model has a better chance of acceptance in the society at large. Almost, whole of Europe has a similar model of welfare and healthcare features. Government supported features (sometimes called Socialist) has certain constraints in terms of efficiency and productivity, but Nordic countries have shown 'how a combination of socialist frame-work along with super-rich individuals can work together for the benefit of society and country and region'. In the present world scenario, emerging countries in Asia (India, Indonesia), Africa (South Africa, Kenya, Nigeria) and South America (Brazil, Argentina) are better place to emulate Nordic model due to the societal disparity in standard of living and income. This article is published by Indo- Nordic Association to create awareness about Nordic countries in India and vice-versa. It would provide a forum for active interactions & networking among Indian,world and Nordic entities. You may contact us for more information on www.indonordicassociation.org .